I am such a sucker for orange veggies (with the exception of carrots!). I have so much fun in the fall with sweet potatoes and winter squashes. Right now my carbohydrate intake is a little higher than normal because of these yummies, but I want to take advantage of seasonal food and I believe that there is wisdom in eating with the seasons. Mark's Daily Apple recently posted on this difference, and though I was a little bummed to find out I've probably never had a real yam, I'm looking forward to trying to fine one. I like a food challenge. 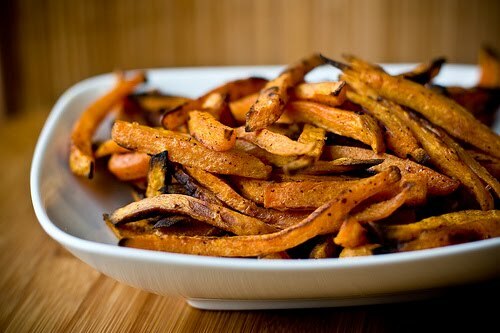 I've been making a lot of sweet potato fries because they're so easy. I get the pre-cut fries from Trader Joe's, but you could also take a little time and chop up a bunch of fries to make throughout the week. It's way less work that way and you have them in the fridge, waiting to be baked. Garlic granules (not garlic powder. Big difference!) Yes, garlic granules are really yummy on sweet potato fries; just use a light hand! For spicy fries, my special blend of garlic granules, paprika, and cayenne and salt. Not TOO much cayenne, now! PS- they're really nice to eat with breakfast/brunch, too! These will not be really crispy, but more soft with crispy bits, just like the picture above. I love this texture.